Not ready to begin a full remodel but your bathroom still needs a makeover? You have options! Take a look at these 10 ideas for inexpensive bathroom updates, and spend no more than $100 on a project! New shelving adds a decorative ambiance to the space and provides more room for storage. You can go with prefab shelving or source your own; reclaimed wood is a popular trend in interior design. Also, don’t feel the need to stick to traditional shelving. Ladders (like the one made here by blogger Anna White), cubbies, and old crates are popular alternatives. Cleaning your grout may seem like a project no one will notice, but it makes a huge difference in the overall appearance of your bathroom. Spotless grout — whether it’s around your sink, shower or floor — will give your bathroom an instant pop of newness. In most cases, using a mixture of warm water, hydrogen peroxide, baking soda and dish soap will remove most stains. If you encounter tougher stains, ask your local hardware store about specialized grout cleaners. Want to take it to the next level? Try painting your grout to spice up your tile! Your shower curtain doesn’t have to be a say-nothing part of your bathroom. Opting for a boldly colored or patterned shower curtain adds personality to the space, and can even set the mood for other parts of your décor. Hanging framed pictures or photographs in your bathroom creates a finished appearance. Short on art? Frame mementos from trips, post cards or other fun items. Once you’ve got your frames, arrange them in an interesting pattern—just be sure to keep them away from water and places they could get knocked off the wall. Above your toilet or on the adjacent wall are popular places for framed artwork. 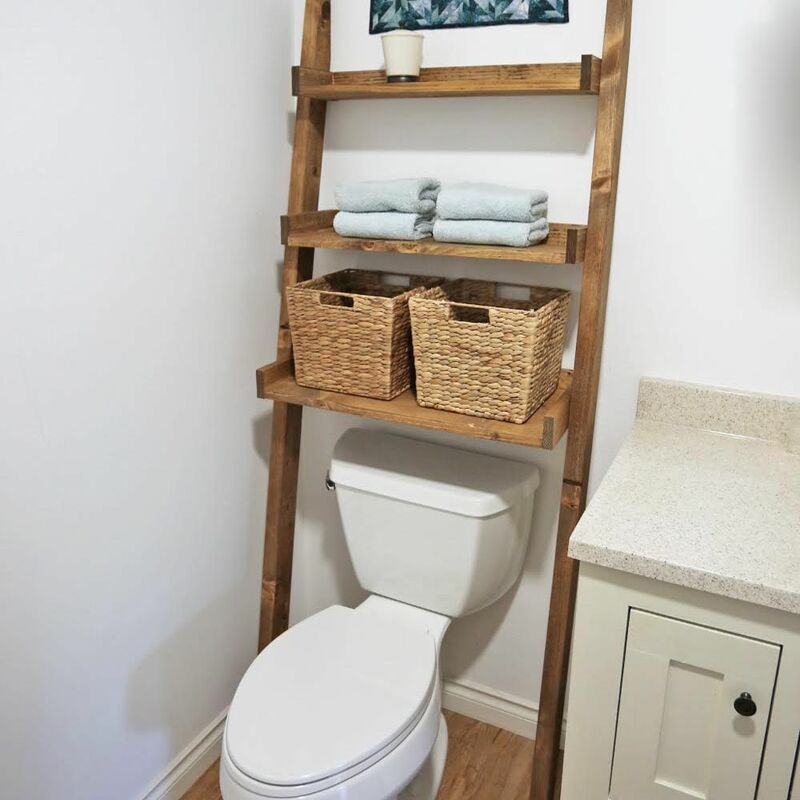 All bathrooms could use a little extra storage. Cubbies are perfect for storing towels, robes, and counter-hogging items like hair dryers and curlers. You can also use your cubbies as a style-forward addition. Wicker and metal cubbies (just like the ones pictured here, used by the blog Rise and Renovate!) are popular options that work for a variety of bathroom aesthetics. Replacing dated or worn cabinet hardware goes a long way in reviving an old vanity. If you like the design of your pulls, consider repainting them. A new color will change up your hardware’s appearance and potentially inspire other updates! Be sure your new pulls are in keeping with the rest of your bathroom décor. Installing ornate, traditional pulls on modern cabinets will take away from the charm of your space. Note: If you’re handy, you can also install a new sink and faucet to match. Replacing a rusty, mineral-corroded shower head with an updated design will improve the appearance, efficiency and comfort of your bathroom—particularly your shower. Rain shower heads in particular are popular for their modern aesthetics and spa-like comfort. Removable shower heads are also a hot item. These also come in a variety sizes and designs. Consider adding a new mirror if your old one is easy to replace. Adding a bold replacement will create a focal point and tie together other additions like new cabinet hardware or shower curtains. If your current mirror is difficult to remove, consider installing a small hanging mirror on an adjacent wall. This will add more depth to the room and act as a fun piece of décor. Framing your existing mirror is also a popular way to revive an old mirror. You can choose from a variety of frame designs, ranging from modern to traditional—just be sure it fits with your bathroom’s existing décor. Adding small details like new rugs, toothpaste holders, hand soap dispensers, and colorful small storage containers, are affordable ways to make a major difference in the appearance of your bathroom. If you have more space, consider creating a small sitting area with two chairs and a coffee table. Plants—whether real or fake—provide a dash of natural beauty to any otherwise antiseptic space. Succulents are popular due to their low maintenance. If you have the space, consider larger potted plants or even smaller indoor trees.